The standard explanation for vagaries of our climate, championed by the IPCC (Intergovernmental Panel on Climate Change), is that greenhouse gases, particularly carbon dioxide, are its principal driver. Recently, an alternative model that the sun is the principal driver was revived by a host of empirical observations. Neither atmospheric carbon dioxide nor solar variability can alone explain the magnitude of the observed temperature increase over the last century of about 0.6°C. Therefore, an amplifier is required. In the general climate models (GCM), the bulk of the calculated temperature increase is attributed to "positive water vapour feedback". In the sun-driven alternative, it may be the cosmic ray flux (CRF), energetic particles that hit the atmosphere, potentially generating cloud condensation nuclei (CCN). Clouds then cool, act as a mirror and reflect the solar energy back into space. The intensity of CRF reaching the earth depends on the intensity of the solar (and terrestrial) magnetic field that acts as a shield against cosmic rays, and it is this shield that is, in turn, modulated by solar activity. Cosmic rays, in addition to CCN, also generate the so-called cosmogenic nuclides, such as beryllium-10, carbon-14 and chlorine-36. These can serve as indirect proxies for solar activity and can be measured e.g., in ancient sediments, trees, and shells. Other proxies, such as oxygen and hydrogen isotopes can reflect past temperatures, carbon isotopes levels of carbon dioxide, boron isotopes the acidity of ancient oceans, etc. Comparison of temperature records from geological and instrumental archives with the trends for these proxies may enable us to decide which one of the two alternatives was, and potentially is, primarily responsible for climate variability. This, in turn, should enable us to devise appropriate countermeasures for amelioration of human impact on air quality and climate. Généralement, les raisons données pour expliquer les caprices de notre climat, les mêmes que celles avancées par le CICC (Comité intergouvernemental sur le changement climatique), veulent que ce soient les gaz à effet de serre, particulièrement le dioxyde de carbone, qui en soient le moteur principal. Récemment, une série d'observations empiriques ont ravivé l'intérêt pour un autre modèle voulant que ce soit le soleil qui en soit le moteur principal. Mais seuls, ni le dioxyde ce carbone ni les variations d'activité solaire ne permet d'expliquer la hausse de température observée au cours du siècle dernier, soit environ 0,6 °C. D'où la nécessité d'un facteur d'amplification. Dans les modèles climatiques généraux (GCM), le gros de l'accroissement calculé de température est dû à « la rétroaction positive de la vapeur d'eau ». Dans le modèle à moteur solaire, ce pourrait être le flux de rayonnement cosmique (FRC), ce pourrait être l'effet des particules énergiques qui en frappant l'atmosphère entraînent une génération possible de nucléus de condensation des nuages (NCN). Alors, les nuages se refroidissent et, comme un miroir, réfléchissent l'énergie solaire dans l'espace. L'intensité du FRC atteignant le sol dépend de l'intensité des champs magnétiques du soleil et de la Terre, lesquels agissent comme un bouclier à l'endroit des rayons cosmiques, le pouvoir de ce bouclier étant à son tour modulé par l'activité solaire. En plus d'entraîner la formation de NCN, les rayons cosmiques, génèrent aussi ce qu'on appelle des nucléides cosmogéniques, comme le béryllium-10, le carbone-14 et le chlore-36. Ces nucléides peuvent servir d'indicateurs indirects de l'activité solaire puisqu'on peut en mesurer la teneur dans des sédiments anciens, des arbres, et des coquilles, par exemple. D'autres indicateurs indirects comme les isotopes d'oxygène et d'hydrogène peuvent refléter les températures de jadis, les isotopes de carbone peuvent refléter les niveaux de dioxyde de carbone, les isotopes de bore peuvent refléter l'acidité des anciens océans, etc. La comparaison entre des registres de mesures de température directes et d'archives géologiques, avec les courbes de tendance de tels indicateurs indirects peut nous permettre de décider laquelle de deux options était et continue possiblement d'être la cause principale des variations climatiques. On pourrait alors décider de contre-mesures appropriées permettant d'atténuer l'impact des activités humaines sur la qualité de l'aire et sur le climat. 1 Carbon dioxide, generally believed to be the most important greenhouse gas and climate modifier, is today the focus of a heated political and scientific debate that has polarized scientists, policy makers, and the public. One side maintains that CO2 is the principal driver of climate, with the Intergovernmental Panel on Climate Change (IPCC, 2001) projecting a global mean temperature rise from 1.5 to 5.8° C by the year 2100. The other side (e.g., Douglass et al., 2004) claims that the role of anthropogenic CO2 on climate has not been proven, and that there is therefore no need for emissions quotas such as those mandated by the Kyoto Protocol. 2 As is usually the case with contentious matters, the reality likely lies somewhere in between. So why is this issue so polarizing? First, past, natural, variations in the carbon cycle and climate are poorly understood. These variations must be taken into account as a baseline for any superimposed human impact. Second, the climate models are, at best, only an approximation of reality. Since I am a geologist and not a modeller, I will deal mostly with the empirical record of climate and the carbon cycle, contemplating them at time scales ranging from billions of years to the human life span (Fig. 1). This perspective is essential, because events on progressively shorter time scales are embedded in, and constrained by, the evolution of the background on longer time scales. 3 The solar/Cosmic Ray Flux (CRF)/climate hypothesis, although discussed by the IPCC (Ramaswamy et al., 2001), was not considered to be a likely candidate for a principal climate driver. This was partly because of the lack of a robust physical formulation for cloud condensation phenomena and partly because it was argued that the observed changes in the Total Solar Irradiance (TSI) flux have been insufficient to account for the observed ~0.6°C centennial temperature increase. Therefore, an amplifier is required to account for the discrepancy. However, similar problems have arisen also in the greenhouse hypothesis, where the amplifier is implicit (the centennial temperature rise in these models is caused by to the "positive water vapour feedback", not to the CO2 itself) and where clouds, a potential net negative feedback and the largest source of uncertainty in the models, are only "parameterized". Yet, the solar energy reflected by the clouds, or the energy of evaporation/condensation, are both about 78 Watts per square metre (Wm-2 ) worldwide. For comparison, the energy input ascribed to "post-industrial" anthropogenic CO2 input is ~ 1.5 Wm-2 and that of incoming solar radiation ~ 342 Wm-2 (IPCC, 2001). A change in cloud cover of a few percent can therefore have a large impact on the planetary energy balance. 4 A growing body of empirical evidence, such as correlations between climate records and solar and cosmic ray activity, or their proxy indicators (e.g., 10 Be, 14C, 36 Cl, geomagnetic field intensity, sunspot numbers), increasingly suggests that extraterrestrial phenomena may be responsible for at least some climatic variability (Bond et al., 2001; Kromer et al., 2001; Neff et al., 2001; Sharma, 2002; Carslaw et al., 2002; Huet al., 2003; Usoskin et al., 2003; Blaauw et al., 2004; Solanki et al., 2004). The correlations of climate with these proxies are mostly better than those, if any, between the coeval climate and CO2. Moreover, inferred and direct observational data of TSI flux yield a record that can explain 80% of the variance in the centennial temperature trend (Foukal, 2002). Celestial phenomena may have been the principal driving factor of climate variability and global temperature even in the recent past. 5 The sun-climate link could be through a number of potential pathways (Rind, 2002; Carslaw et al., 2002), where the solar flux is amplified by (1) stratospheric chemistry (e.g., ozone) because of changes in solar UV spectrum, (2) cloud coverage modulated by the galactic CRF, or (3) a combination of these or other factors. Considering that statistical evaluation of 20th century data shows that solar UV radiation may account for only about 20% of the variance in surface temperature data (Foukal, 2002), alternative (2) is the favoured hypothesis. In this alternative, an increase in TSI results not only in an enhanced thermal energy flux, but also in more intense solar wind that attenuates the CRF reaching the Earth (Tinsley and Deen, 1991; Svensmark and Friis-Christensen, 1997; Marsh and Svensmark, 2000; Solanki, 2002). This, the so-called heliomagnetic modulation effect reflects the fact that the solar magnetic field is proportional to TSI and it is this magnetic field that acts as a shield against cosmic rays. The terrestrial magnetic field acts as a complementary shield, and its impact on CRF is referred to as geomagnetic modulation (Beer et al., 2002). The CRF, in turn, is believed to correlate with the low altitude cloud cover (Fig. 2). The postulated causation sequence is therefore: brighter sun ⇒ enhanced thermal flux + solar wind ⇒ muted CRF ⇒ less low-level clouds ⇒ lower albedo ⇒ warmer climate. Diminished solar activity results in an opposite effect. The CRF/cloud-cover/climate link is also physically feasible because the CRF likely governs the atmospheric ionization rate (Carslaw et al., 2002), and because recent theoretical and experimental studies relate the CRF to the formation of charged aerosols (Harrison and Aplin, 2001; Lee et al., 2003), which could serve as cloud condensation nuclei (CCN), as was demonstrated independently by ground based and airborne experiments (Eichkorn et al., 2002). Figure 1. Hierarchy of time scales discussed in this article. Figure 2. Solar irradiance (SI), galactic cosmic ray (CR) flux and low cloud (LC) cover, 1983 – 2001 (adapted from Marsh and Svensmark, 2003a and Marsh et al., 2005). Note the reversed scale for SI. Some authors (Laut, 2003) argue that the apparent post-1995 divergence of clouds from celestial trends disqualifies the correlations. However, the discrepancy may arise from a modified cross-calibration of satellites, following the late 1994 hiatus in polar orbit flights (Marsh and Svensmark, 2003a). A correction for this drift (thick full line LC') results in a good agreement for all parameters (see also Pallé et al., 2004b and Usoskinet al., 2004). 6 The CRF reaching the planet has not only an extrinsic variability reflecting its attenuation by solar wind, but also an intrinsic one arising from a variable interstellar environment (Shaviv, 2002a, b). Particularly large CRF variability should arise from passages of the solar system through the Milky Way's spiral arms that harbour most of the star formation activity. Such passages recur at about 143 ± 10 million years (Ma) intervals and these variations are expected to be about an order of magnitude more effective than the extrinsic ones. 7 In a nutshell, the intrinsic interstellar intensity of CRF may have controlled the long-term climate variability on multimillion-year time scales. Superimposed on this long-frequency/large-amplitude wavelength are smaller oscillations on millennial to annual time scales, generated by the variable solar activity that modulates either the CRF bombarding the Earth, the planetary atmospheric dynamics, or both. Tentatively, I accept this interpretation as a working hypothesis for the subsequent discussion, but hasten to acknowledge that the CRF cloud linkage is still a hotly contested issue. Accepting this scenario as a working hypothesis, how does it withstand scrutiny if tested against the hierarchical geologic record (Fig. 1) of climate and the carbon cycle? 8 To understand the role of atmosphere, water, and life in climate evolution over geologic history, it is essential to study ancient examples. Yet, we have no unequivocal samples of ancient waters, and the oldest samples of air are in bubbles frozen into Antarctic ice near the time of its formation, reaching back some 420,000 to 800,000 years. The situation is somewhat better with the remnants of life, because mineralized shells go back to about 545 million years, the times known as the Phanerozoic, and morphological evidence of living things, algae and bacteria, and of fossilized stromatolites, have been found in western Australia in rocks as old as 3.5 billion years (Fig. 3). Kerogen, body tissues altered by temperature and pressure, has been found in still older rocks approaching 4 billion years. This is remarkable, because the oldest rocks ever recovered, found near Yellowknife in northwestern Canada, are of about the same age (Bowring et al., 1989). Figure 3. 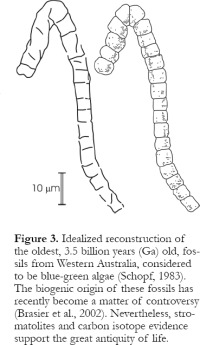 Idealized reconstruction of the oldest, 3.5 billion years (Ga) old, fossils from Western Australia, considered to be blue-green algae (Schopf, 1983). The biogenic origin of these fossils has recently become a matter of controversy (Brasier et al., 2002). Nevertheless, stromatolites and carbon isotope evidence support the great antiquity of life. 9 These observations, however, are only qualitative. If we want to understand the operation of the carbon cycle and its role in the climate system, it is necessary to know not only that there was life, but also how much of it there was. In order to establish this, we have to rely on the derivative, or proxy, signals. In our case, such proxies are isotopes, particularly of carbon and oxygen. 10 From the measurements of isotope ratios of carbon in modern living things and of carbon dissolved in seawater, the rough proportion of reduced to oxidized carbon is calculated to be about 1:4 (Schidlowski et al., 1975). Remarkably, when these carbon isotopes are traced back in geologic history, the average carbon isotopic composition of seawater (Fig. 4) and of most of the kerogen (Hayes et al., 1983) was similar to today. Hence, we get about the same 1:4 ratio as far back as 3.5, and possibly 4, billion years ago. Assuming that the stocks of global carbon were conservative, and stated rather boldly, not only did we have life as far back as we had rocks, but there was as much life then as today, albeit in its primitive form. We can conclude, then, that the fundamental features of the carbon cycle were established as early as 4 billion years ago. 11 What does this mean for the global carbon cycle? The simplest assumption would be that it might not have been that different from today. Yet, such a proposition is difficult to reconcile with the so-called "faint young sun" paradox (Sagan and Mullen, 1972). Based on our understanding of the evolution of stars, the young sun was about 30 percent less luminous than it is today, and became brighter with age. With such low radiative energy from the sun, our planet should have been a frozen ice ball until about 1 billion years (Ga) ago. Yet, we know that running water shaped the surface of the planet as far back as the geologic record goes. 12 To resolve this paradox, some argue that a massive greenhouse, caused principally by CO2 (e.g., Kasting, 1993), must have warmed up the young earth. Theoretical calculations, set up to counteract the lower solar luminosity, yield CO2 atmospheric concentrations up to ten thousand times greater than today's value of 0.035 %. Yet, this is at odds with the geologic record. For example, at low seawater pH, expected from such high partial pressures of carbon dioxide (pCO2), ancient limestones should be enriched in 18O relative to their younger counterparts, yet the secular trend that we observe in the geologic record (Shields and Veizer, 2002) shows exactly the opposite. Factors more complex than a massive CO2 greenhouse would have to be invoked to explain the warming of this planet to temperatures that may have surpassed those of the present day. A plausible alternative is a change in the cloud cover (Rossow et al., 1982) because clouds can compensate for 50% variations in radiative energy of the sun (Ou, 2001), bringing forward again the role of CRF as the potential solution. Considering that young stars of the same category as our sun would have been characterized by a stronger solar wind that muted the CRF, the resulting reduction in cloudiness may have compensated for the sun's reduced luminosity (Shaviv, 2003). Note also that theoretical models of Milky Way evolution indicate a diminished star formation rate between ~ 2 and 1 Ga ago, while the Paleo- and Neoproterozoic were strong maxima. This dovetails nicely with the geologic record (Frakes et al., 1992; Crowell, 1999), with massive glaciations at these two maxima and their absence in the intermediate time interval. 13 The record of climate variations during the Phanerozoic (Fig. 1) shows intervals of tens of millions of years duration characterized by predominantly colder or predominantly warmer episodes, called icehouses and greenhouses, respectively (Fig. 5). Superimposed on these are higher order climate oscillations, such as the episodic waning and waxing of ice sheets. 14 In the Phanerozoic, some organisms secreted their shells as the mineral calcite (CaCO3), which often preserves the original oxygen isotope ratio, and this, in turn, reflects the ambient seawater temperature. Veizer et al. (1999) generated a large database of several thousand well-preserved calcitic shells that cover this entire 545 million years time span. Such detrended isotope data correlate well with the climatic history of the planet (cf. 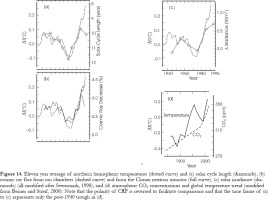 Scotese, 2002; Boucot and Gray, 2001), with tropical sea surface temperatures fluctuating by perhaps 5 to 9° C between the apexes of icehouse and greenhouse times, respectively (Fig. 5, top). Figure 4. Carbon isotopic composition of proxies for paleo-seawater, ancient limestones and calcareous shells (circles) and dolostones (triangles). Adapted from Shields and Veizer (2002). 15 The situation is entirely different for the CO2 scenario. For the Phanerozoic, the estimates of atmospheric pCO2 levels are not only internally inconsistent, but they also do not show any correlation with the paleoclimate record (Fig. 5, bottom). In that case, what could be an alternative driving force of climate on geological time scales? 16 As suggested by theoretical considerations, the "icehouse" episodes and the oxygen isotope cold intervals should coincide with times of high cosmic ray flux, and the "greenhouse" ones with the low CRF (Fig. 6). This correlation may explain about 2/3 of the observed oxygen isotope "temperature" signal (Shaviv and Veizer, 2003). Thus celestial phenomena were likely the principal driver of climate on million year time scales. 17 Drilling at Vostok in Antarctica has produced an outstanding record of climate and atmospheric composition on millennial to centennial time scales for the last 420,000 years (Figs. 1, 7). The laminae of ice contain frozen air bubbles, and in these the amount of CO2 and methane indeed increases with temperature. Yet, new high-resolution studies show that at times of cold to warm transitions, temperature changes come first, leading CO2 changes by several centuries (Mudelsee, 2001; Clarke, 2003; Vakulenko et al., 2004). If so, the CO2 levels would be a response to, and not the cause of, the change in temperature (climate). CO2 may then serve as a temperature amplifier, but not as the climate driver. 18 If CO2 were not the driver, what could the alternative be? For the last 2 cycles of the Vostok record, spanning about 200,000 years, the residual geomagnetic field and the content of 10Be in sediments correlate antithetically (Fig.8), at least at the 100,000 year frequency. 10Be is generated by the CRF interacting with our atmosphere. Since the solar and terrestrial magnetic fields are the shield that modulates the intensity of the CRF reaching the Earth, this anti-correlation is to be expected. The CRF, in turn, may regulate the terrestrial cloudiness and albedo, hence the climate. Having the estimates of the geomagnetic field intensity and 10 Be concentrations enables calculation of the intensity of past solar irradiance. The latter appears to reflect surprisingly well coeval climate oscillations as recorded at Vostok and in the stacked oxygen isotope record of the oceans (Fig. 9). This points again to the previously discussed extrinsic modulation of the CRF by the solar driver. Figure 5. 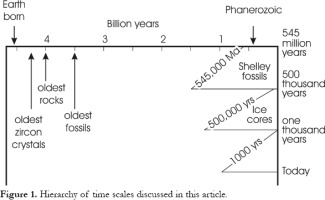 Phanerozoic climatic indicators and reconstructed p CO2 levels. The curve in the upper set is the relative paleotemperature trend as calculated from the δ18 O values of calcitic shells (Veizer et al., 2000). The dotted histograms mark the lowest paleolatitude (right-hand vertical axis) at which the ice rafted debris was observed in ancient sediments. The boxes represent cool climate modes (icehouses) and the intervening intervals the warm modes (greenhouses), as established from sedimento-logical criteria (Frakes et al., 1992). The bottom set of curves describes the reconstructed histories of the past p CO2 variations (GEOCARB III) by Berner and Kothavala (2001), Klimafakten (Berner and Streif, 2000) and Rothman (2002). A recent argument by Royer et al. (2004) that the δq8 O trend of Veizer et al. 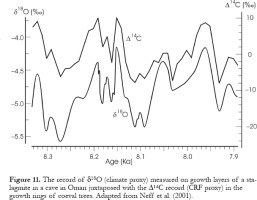 (2000) reflects the pH rather than the temperatures of ancient oceans is interesting, but this proposition, apart from being rather arbitrary, cannot explain the magnitude of the δ18 O trend (Shaviv and Veizer, 2004a; Wallmann, 2004) and is also at odds with the paleoclimatological reconstructions (see Scotese, 2002, Boucot and Gray, 2001, and Boucot et al, 2004). As for the "critique" of Rahmstorf et al. (2004) see Shaviv and Veizer (2004b), http://www.phys.huji.ac.il/~shaviv/ClimateDebate, and de la Fuente Marcos and de la Fuente Marcos (2004). 19 Additional support for celestial forcing comes from ocean sediments and from caves, records that cover the times of transition from the last glacial episode into the warmer climates of our times, that is the time from about 11,500 to some 2,000 years BP. For an Atlantic drill core taken west of Ireland (Bond et al., 2001), the incidence of "ice rafted debris" (IRD), small debris pieces that fall to the ocean floor from melting ice floes that drift on the surface, coincides with the colder climates (Fig. 10). In addition, the cold times are characterized by high concentrations of 10Be, as measured in sediments, and by an "excess" of 14C, as observed in tree rings on land. Since both 10 Be and 14C are products of the CRF interacting with our atmosphere, and because their subsequent redistribution pathways are entirely different, the only process that can explain all these positive correlations is an intensified CRF. Still better correlation is present in the cave sediments of Oman (Fig. 11). As stalagmites grow, they produce growth rings similar to those in the trees. The oxygen isotope ratio measured in these rings is a reflection of climate, in this particular case of monsoon patterns. The correlation with 14C, which is the product of CRF, is excellent. More recently, these cosmogenic nuclide/climate correlations were extended up to 2000 years BP and corroborated by additional records from an Alaskan lake (Hu et al., 2003), several European and American speleothems (references in Niggemann et al., 2003), polar ice shields (Laj et al., 2000; St-Onge et al., 2003), deep-sea sediments (Christl et al., 2003), and northern peat bogs (Blaauw et al., 2004) - geographic coverage of a considerable extent. Figure 6. The variations in the cosmic ray flux (ϕ ) and tropical seawater temperature variations (ΔT ) over the Phanerozoic. The upper curves describe the reconstructed trends for cosmic ray flux (CRF) within their uncertainty band (stippled). 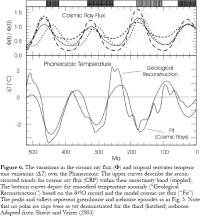 The bottom curves depict the smoothed temperature anomaly ("Geological Reconstruction") based on the δ18 O record and the model cosmic ray flux ("Fit"). The peaks and valleys represent greenhouse and icehouse episodes as in Fig. 5. Note that no polar ice caps were as yet demonstrated for the third (hatched) icehouse. Adapted from Shaviv and Veizer (2003). Figure 7. Antarctic (Vostok) ice core data for the last 400,000 years. 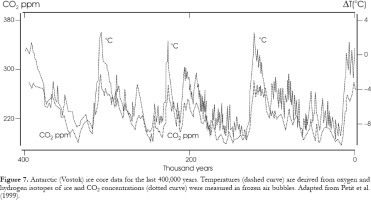 Temperatures (dashed curve) are derived from oxygen and hydrogen isotopes of ice and CO2 concentrations (dotted curve) were measured in frozen air bubbles. Adapted from Petit et al. (1999). 20 Let us now look at the record of the last millennium (Fig. 1), starting with Greenland, the climate record of the northern hemisphere. The calculations based on oxygen isotope values in ice layers suggest that the temperatures in the 11th century were similar to those of today (Fig. 12). This warm interval was followed by a temperature decline until the 14th century, then by generally cold temperatures that lasted until the 19th century, and finally by a warming in the 20th century. The "Medieval Climatic Optimum" (MCO) and the "Little Ice Age" (LIA), were both global phenomena (Soon and Baliunas, 2003; McIntire and McKitrick, 2003), and not, as previously claimed (Mann et al., 1999), restricted solely to Greenland or to the North Atlantic. Note that the coeval "ice bubble CO2" pattern in Greenland and Antarctic ice caps was essentially flat (IPCC, 2001), despite these large climatic oscillations. CO2 begins to rise only at the termination of the "Little Ice Age", toward the end of the 19th century. In direct contrast to CO2, 14C and 10 Be correlate convincingly with the climate record (Fig. 13), again arguing for celestial phenomena as the primary climate driver. 21 The IPCC (2001) global mean surface temperature record shows an increase of about 0.6°C since the termination of the "Little Ice Age". The bulk of this rise happened prior to the early 1940's, followed by a cooling trend until 1976 and a resumption of temperature rise subsequently (Fig. 14d). In contrast to temperature, the rise in atmospheric CO2, most likely from the burning of fossil fuels plus land-use changes, proceeded in an exponential fashion. This mismatch raises two questions: (1) why the large temperature rise prior to the early 40's, when 80% of the cumulative anthropogenic CO2 input is post-World War II?, and (2) why the subsequent three decade long cooling despite the rising CO2? In contrast to CO2, the temperature trend correlates well with the solar properties, such as the CRF and TSI (Figs. 14b,c), except perhaps for the last two decades of the 20th century that may or may not be an exception to this pattern. For these decades, the direct estimates of TSI flux (Fig. 14c) could not apparently explain the entire observed magnitude of the temperature rise (Ramaswamy et al., 2001; Solanki, 2002; Solanki et al., 2004; Foukal et al., 2004) and the discrepancy has to be attributed, therefore, to greenhouse gases, specifically CO2. It is this discrepancy, and the apparent coherency of model predictions with observed climate trends (Karoly et al., 2003), that are the basis for the claim that the anthropogenic signal emerges from natural variability in the 1990's, with CO2 becoming the "principal climate driver". While this may be the case, note that the General Climate Models (GCMs) are essentially water-cycle models that generally do not incorporate the active carbon cycle and its dynamics. CO2 is "prescribed" in most models as a spatially uniform concentration, and inputted in the form of energy (~ 4 Wm-2 for CO2 doubling). These models would yield outcomes in the same general direction, regardless of the source of this additional energy, be it CO2 or TSI. Moreover, taking into account the empirical evidence, such as the unprecedented solar activity during the late 20th century (Fig. 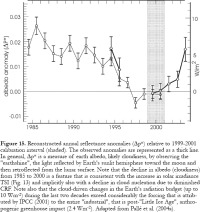 13) or the coeval decline in global albedo ("earthshine") (Fig. 15), and considering that the 1915-1999 TSI trend from the Mt. Wilson and Sacramento Peak Observatories can explain 80% of the 11-year smoothed variance in global temperature (Foukal, 2002), the celestial cause as a primary driver again appears to be a more consistent explanation. Additional support for such a scenario arises from the apparent relationship between solar cycle and precipitation/biological activity on land (Fig. 16). Terrestrial photosynthesis/respiration is the dominant flux for atmospheric CO2 on annual to decadal time scales and any potential causative relationship can only be from the sun to the earth. As a final point, the GCMs predict that the most prominent centennial temperature rise should have been evident in the higher troposphere. Yet, the balloon and satellite data (Fig. 17) do not show any clear temporal temperature trend (IPCC, 2001). Instead, their interannual temperature oscillations correlate clearly with the solar irradiance and CRF, with "no vestiges of the anthropogenic signal" (Kärner, 2002). All this favours the proposition that celestial phenomena may have been the primary climate driver even for the most recent past. Figure 8. The intensity of the residual terrestrial magnetic field, and the 10 Be content of marine sediments, for the last 200,000 years. Adapted from Sharma (2002). See also Christl et al. (2003). Figure 9. 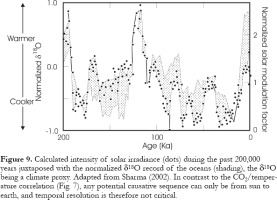 Calculated intensity of solar irradiance (dots) during the past 200,000 years juxtaposed with the normalized δ18 O record of the oceans (shading), the δ18 O being a climate proxy. Adapted from Sharma (2002). In contrast to the CO2 /temperature correlation (Fig. 7), any potential causative sequence can only be from sun to earth, and temporal resolution is therefore not critical. 22 In summary, the above empirical observations on all time scales point to celestial phenomena as the principal driver of climate, with greenhouse gases acting only as potential amplifiers. If solar activity accounts statistically for 80% of the centennial global temperature trend, while at the same time the measured variability in solar energy flux is insufficient to explain its magnitude, an amplifier that is causally related to solar energy flux should exist. The earlier discussed cloud/CRF link and/or UV related atmospheric dynamics could be such an amplifier(s). The existing general climate models may therefore "require an improved understanding of possible climate sensitivity to relatively small total irradiance variations" (Foukal, 2002). I am aware that some of the discussed trends may have explanations based on the internal working of the earth system. For example, the 14C wiggles can be explained as changes in ocean circulation efficiency (ventilation), but this cannot explain the complementary 10 Be patterns. In their sum, these explanations rely on many, at times arbitrary, causations and the overall structure is thus more complex than the celestial alternative. When two hypotheses can equally well explain the observational data, it is the simpler one that is to be preferred (Occam's razor). I wish to emphasize, nevertheless, that it is not the intention of this contribution to discount superimposed geological, oceanographic, atmospheric and anthropogenic phenomena as contributing factors. Space considerations, however, do not allow this article to focus on anything but the nature of the "primary climate driver". Figure 10. The borehole record (Bond et al., 2001) of ice rafted debris (IRD), which is a climate proxy, and the coeval record for CRF proxies, 10 Be in sediments and Δ14C in growth rings of trees. Adapted from Kromer et al. (2001). SO WHAT IS THE SEQUENCE? 23 The review of empirical evidence strongly suggests that it may be the celestial phenomena, sun and cosmic rays, that are the principal climate driver. While the individual lines of evidence may have some weak points (but so do all alternative explanations), overall the celestial proposition yields a very consistent scenario for all time scales. The intrinsic CRF flux may have been responsible for the pronounced climatic trends on multimillion year time scales, while the extrinsic modulation by solar activity and earth dynamo could have been the major driver for the superimposed subdued climate oscillations on the millennial to annual time scales. This input drives the water cycle, with water vapour likely acting as a positive feedback and cloud formation as a negative one (Fig. 18). It also generates the flux of cosmogenic nuclides, such as 10 Be, 14C and 36 Cl. The hydrologic cycle, in turn, provides us with our climate, including its temperature component. On land, sunlight, temperature, and concomitant availability of water are the dominant controls of biological activity and thus of the rate of photosynthesis and respiration. In the oceans, the rise in temperature results in release of CO2 into air. These two processes together increase the flux of CO2 into the atmosphere. If only short time scales are considered, such a sequence of events would be essentially opposite to that of the IPCC scenario, which drives the models from the bottom up, by assuming that CO2 is the principal climate driver and that variations in celestial input are of subordinate or negligible impact. This is not to dismiss CO2 as a greenhouse gas with no warming effect at all, but only to point out that CO2 plays mostly a supporting role in the orchestra of nature that has a celestial conductor and the water cycle as its first fiddle. Consider an example that is familiar to every geologist, the weathering of rocks. This process is believed to have been the controlling sink for atmospheric CO2 on geological time scales (Berner, 2003), and indeed it was. Yet, in reality, it is the water that is the agent of physical and chemical weathering. Weathering would proceed without CO2, albeit with some chemical reactions modified, but not without water, whatever the CO2 levels. For almost any process, and time scale, the water and carbon cycles are coupled, but water is orders of magnitude more abundant. The global water cycle is therefore not "just there" to react on impulses from the carbon cycle, but is actively shaping it. 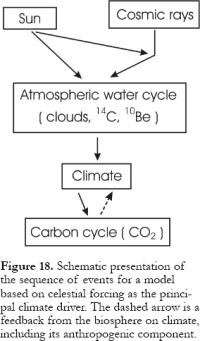 The tiny carbon cycle is piggybacking on the huge water cycle (clouds included), not driving it. In such a perspective, CO2 can amplify or modulate natural climatic trends, but it is not likely to be their principal "driver". If so, how are the global water and carbon cycles coupled? Figure 11. The record of δ18 O (climate proxy) measured on growth layers of a stalagmite in a cave in Oman juxtaposed with the Δ14C record (CRF proxy) in the growth rings of coeval trees. Adapted from Neff et al. (2001). Figure 12. The temperature change (ΔT) and CO2 records of the last millennium from a Greenland ice core (GISP2). Temperature was calculated from the 50 year smoothed record as T(ºC) = 0.6906·δ18 O– 13.68. The δ18 O database is available at ftp://ftp.ngdc.noaa.gov/paleo/icecore/greenland/summit/gisp2/isotopes/d18o1yr.txt. The detailed structure showing the coincidence of cold intervals with sun activity minima (W to D; Wolf, Spörer, Maunder, Dalton) may or may not be statistically valid because of the noisy nature of the proxy signals, but the overall trend is confirmed also by the borehole temperature profiles (Dahl-Jensen et al., 1998). Adapted from Berner and Streif (2000). 24 The atmosphere today contains ~ 730 PgC (1 PgC = 1015 g of carbon) as CO2 (Fig. 19). Gross primary productivity (GPP) on land, and the complementary respiration flux of opposite sign, each account annually for ~ 120 Pg. The air/sea exchange flux, in part biologically mediated, accounts for an additional ~90 Pg per year. Biological processes are therefore clearly the most important controls of atmospheric CO2 levels, with an equivalent of the entire atmospheric CO2 budget absorbed and released by the biosphere every few years. The terrestrial biosphere thus appears to have been the dominant interactive reservoir, at least on the annual to decadal time scales, with oceans likely taking over on centennial to millennial time scales. Interannual variations in atmospheric CO2 levels mimic the Net Primary Productivity (NPP) trends of land plants, and the simulated NPP, in turn, correlates with the amount of precipitation (Nemani et al., 2002, 2003; Huxman et al., 2004) (Fig. 16). The question therefore arises: is the terrestrial water cycle and NPP driven by atmospheric CO2 (CO2 fertilization) or is it the other way around? As a first observation, note that the "troughs" in precipitation and NPP coincide with the minima in sunspot activity (Fig. 16). As already pointed out, if a causative relationship exists, it can only be from the sun to the earth. Figure 13. Time series of the sunspot numbers (reconstructed from 10 Be in ice cores from Antarctica and Greenland), and of direct observations of sunspot numbers since 1610. The record of 14C in tree rings, not reproduced here due to visual considerations, shows a similar pattern. Note the low 10 Be (reciprocal of sunspot numbers) and 14C during the Medieval Climate Optimum (MCO) and their high values during the Little Ice Age. Note also the very high solar activity for the latest 60 years, unprecedented for the last 8,000 years of Earth history (Solanki et al., 2004). W, S, M and D are the sun activity minima as in Fig. 12. O is the Oort minimum. Modified from Usoskin et al. (2003). Figure 14. Eleven year average of northern hemispheric temperatures (dotted curve) and (a) solar cycle length (diamonds), (b) cosmic ray flux from ion chambers (dashed curve) and from the Climax neutron monitor (full curve), (c) solar irradiance (diamonds) (all modified after Svensmark, 1998), and (d) atmospheric CO2 concentrations and global temperature trend (modified from Berner and Streif, 2000). Note that the polarity of CRF is reversed to facilitate comparisons and that the time frame of (a) to (c) represents only the post-1940 trough in (d). 25 During photosynthesis, a plant has to exhale (transpire) almost one thousand molecules of water for every single molecule of CO2 that it absorbs. This so-called "Water Use Efficiency" (WUE), is somewhat variable, depending on the photosynthetic pathway employed by the plant and on the temporal interval under consideration, but in any case, it is in the hundreds to one range (Taiz and Ziegler, 1991; Telmer and Veizer, 2000). The relationship between WUE and NPP deserves a more detailed consideration. In plant photosynthesis, water loss and CO2 uptake are coupled processes (Nobel, 1999), as both occur through the same passages (stomata). The WUE is determined by a complicated operation that maximizes CO2 uptake while minimizing water loss. Consequently, the regulating factor for WUE, and the productivity of plants, could be either the atmospheric CO2 concentration or water availability. From a global perspective, the amount of photosynthetically available soilwater, relative to the amount of atmospheric CO2, is about 250:1, much less than the WUE demand of the dominant plants, suggesting that the terrestrial ecosystem is in a state of water deficiency (Lee and Veizer, 2003). 26 The importance of the water supply for plant productivity is clearly evident from the NPP database that is a collection of worldwide multi-biome productivities, mostly established by biological methods (Fig. 20). The principal driving force of photosynthesis is unquestionably the energy provided by the sun, with the global terrestrial system reaching light saturation at about an NPP of 1150 ± 100 g carbon per year (Fig. 20). If the sun is the driver, what might be the limiting variable? Except locally, CO2 cannot be this limiting factor because its concentration is globally almost uniform, while NPP varies by orders of magnitude. Temperature, because of its quasi anticorrelation with the NPP (Fig. 16), is not a viable alternative either. In contrast, the positive correlation between NPP and precipitation is clear-cut (Fig. 20) and water availability is therefore the first order limiting factor of ecosystem productivity (Huxman et al., 2004). Transpiration by ecosystems of cold and temperate regions recycles about 1/2 to 2/3 of precipitation into the atmosphere, while for tropical regions the recycling is almost wholesale. Thus the former appear to have been water starved (Fig.20), while the tropical ecosystems with their efficient water recycling are likely limited only by the amount of available sunlight, the latter modified within relatively narrow limits, mostly by clouds. For the global ecosystem, an increase in sunlight, humidity and temperature is a precondition for, not a consequence of, CO2 or nitrogen "fertilization". And luckily so, otherwise our tree planting effort to sequester CO2 would only lead to a continuous massive pumping of water vapour, a potent greenhouse gas, from the soils to the atmosphere. Figure 15. Reconstructed annual reflectance anomalies (Δ p*) relative to 1999-2001 calibration interval (shaded). The observed anomalies are represented as a thick line. In general, Δ p* is a measure of earth albedo, likely cloudiness, by observing the "earthshine", the light reflected by Earth's sunlit hemisphere toward the moon and then retroflected from the lunar surface. Note that the decline in albedo (cloudiness) from 1985 to 2000 is a feature that is consistent with the increase in solar irradiance TSI (Fig. 13) and implicitly also with a decline in cloud nucleation due to diminished CRF. Note also that the cloud-driven changes in the Earth's radiation budget (up to10 Wm-2 ) during the last two decades exceed considerably the forcing that is attributed by IPCC (2001) to the entire "industrial", that is post-"Little Ice Age", anthropogenic greenhouse impact (2.4 Wm-2 ). Adapted from Pallé et al. (2004a). 27 In order to test the hypothesis of CO2 "piggybacking" on the water cycle, several large watersheds were examined, because there the water balance can be deconvolved into precipitation, discharge, evaporation, interception and transpiration fluxes. Knowing the transpiration flux and the requisite WUE, it is then possible to calculate the photosynthetic sequestration capacity for CO2 for a given watershed. Taking the Mississippi basin (Fig. 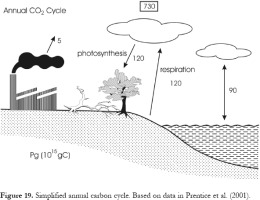 20) as an example (Lee and Veizer, 2003), plant transpiration recycles about 60% of precipitation back into the atmosphere and the calculated, water balance-based, annual photosynthetic sequestration of CO2 by plants is then 1.16 Pg of carbon. This is essentially identical to the heterotrophic soil respiration flux of 1.12 PgC derived by biological approaches for the same watershed. Hence, the suggestion that the carbon cycle is "piggybacking" on the water cycle is a viable proposition. This scenario is supported also by the satellite data of global productivity for the 1982-1999 period, with "climatic variability overland exerting a strong control over the variations in atmospheric CO2 " (Nemani et al., 2003). In these two decades the global biomass grew by 6% (3.4 PgC). Almost one half of the increase happened, surprisingly, in the Amazon basin, and was caused by a decrease in the cloud cover (decline in CRF?) and to a concomitant 20th century increase in solar radiation (Figs. 13, 14, 15). Again, while CO2 may act as an amplifying greenhouse gas, the actual atmospheric CO2 concentrations are controlled in the first instance by the climate, that is by the sun-driven water cycle, and not the other way around. Figure 16. 1900-1993 variations in annual averages of air temperature (T - dotted line) and precipitation (P - dashed line) for conterminous U.S. together with the simulated Net Primary Productivity (NPP - full line) smoothed with a 5-year filter (adapted from Nemani et al., 2002). 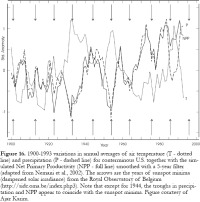 The arrows are the years of sunspot minima (dampened solar irradiance) from the Royal Observatory of Belgium(http://sidc.oma.be/index.php3). Note that except for 1944, the troughs in precipitation and NPP appear to coincide with the sunspot minima. Figure courtesy of Ajaz Karim. Figure 17. Annual variability in tropospheric temperature, TSI (Δ Fs ) and CRF. Note the reversed scale for CRF. Modified from Marsh and Svensmark (2003b) and Marsh et al. (2005). Figure 18. Schematic presentation of the sequence of events for a model based on celestial forcing as the principal climate driver. The dashed arrow is a feedback from the biosphere on climate, including its anthropogenic component. 28 At this stage, two scenarios of potential human impact on climate appear feasible: (1) the standard IPCC model that advocates the leading role of greenhouse gases, particularly of CO2, and (2) the alternative model that argues for celestial phenomena as the principal climate driver. The two scenarios are likely not even mutually exclusive, but a prioritization may result in different relative impact. Models and empirical observations are both indispensable tools of science, yet when discrepancies arise, observations should carry greater weight than theory. If so, the multitude of empirical observations favours celestial phenomena as the most important driver of terrestrial climate on most time scales, but time will be the final judge. Should the celestial alternative prevail, the chain of reasoning for potential human impact may deviate from that of the standard IPCC model, because the strongest impact may be indirect, via the formation of cloud condensation nuclei (CCN). The CRF-generated positive and negative ions combine, within minutes, into electrically neutral aerosols, but only if the two ions are large enough. The required size of these "cluster ions" is reached by addition of atmospheric molecules, particularly sulphuric acid. Since H2SO4 is highly hygroscopic, it attracts also water molecules. In this way, the ~30-100 nm large CCN required as precursors for droplets can potentially be generated (Carslaw et al., 2002; Lee et al., 2003). Thus, sulphur compounds (and perhaps dust, soot and secondary particles, which are formed by condensation of low vapour-pressure gases) could play a major role in this seeding process. In the northern hemisphere, the precursor of sulphuric acid, sulphur dioxide gas, originates mostly from anthropogenic activities, but natural sources, such as volcanic eruptions or DMS from marine plankton, are also substantial. Figure 19. Simplified annual carbon cycle. Based on data in Prentice et al. (2001). Figure 20. 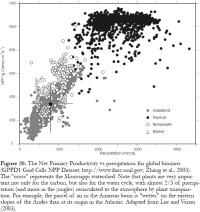 The Net Primary Productivity vs precipitation for global biomass (GPPD1 Grid Cells NPP Dataset; http://www.daac.ornl.gov; Zheng et al., 2003). The "cross" represents the Mississippi watershed. Note that plants are very important not only for the carbon, but also for the water cycle, with almost 2/3 of precipitation (and more in the jungles) recirculated to the atmosphere by plant transpiration. For example, the parcel of air in the Amazon basin is "wetter" on the eastern slopes of the Andes than at its origin in the Atlantic. Adapted from Lee and Veizer (2003). 29 Although the role of clouds is not well understood (IPCC, 2001), it appears that the upper tropospheric clouds warm, while the lower clouds, such as those potentially generated by the above CRF seeded processes, cool the climate. In such a scenario, the impact of pollution, if indeed significant, could even potentially result in global cooling (Carslaw et al., 2002) instead of global warming, similar to the IPCC chain of reasoning that is invoked as an explanation for the 1940-1976 cooling trend (Fig. 14d). In addition, we would have to deal not with a global issue of atmospheric CO2, but with large regional phenomena, because it is these that control the dispersion of aerosols, sulphur and nitrogen compounds. We are not yet in a situation where quantitative projections of this impact on climate can be provided (Schwartz, 2004). Indeed, we do not even know if it is at all globally significant, equal to any potential warming generated by CO2, or much larger. In any case, the strategy that emphasizes reduction of human emissions is sound for both the celestial and the CO2 alternative. Nevertheless, this strategy can be pursued in two ways. It can be based on global reduction of CO2, because this would result also in collateral reduction of particulates, sulphur and nitrogen compounds. These are not only potential climate drivers, but also pollutants and their reduction will improve our air quality, regardless of the climate impact of otherwise environmentally benign CO2. At current atmospheric levels, CO2 is in fact an essential commodity for propagation of life on this planet. Any remedial measures based on the global CO2 scenario are also costly. For the celestial alternative, the remedial measures may focus directly on the "collateral" pollutants, which could potentially result in a substantial reduction of the economic cost to mankind. However, the decision as to the best strategy is not a simple prerogative of science, but must also take into account political, economic and social considerations. In my four decades of research into the evolution of the Earth, always with strong environmental connotations, I was almost exclusively financed by the Natural Sciences and Engineering Research Council of Canada (NSERC) and the Deutsche Forschungsgemeinschaft (DFG). In the last decade, particularly relevant to this article, the research was supported by two major sources, the top research award of the DFG (Leibniz Prize endowed with 3 million DM) and the support of the Research Chair in "Earth System" financed jointly by NSERC and the Canadian Institute for Advanced Research (CIAR). The donors to CIAR include Noranda and Dr. G.G. 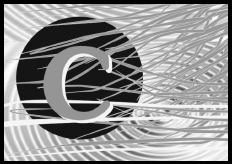 Hatch, with the sponsorship based on an arms' length relationship via CIAR and NSERC. Personally, this last decade has been a trying period because of the years of internal struggle between what I wanted to believe and where the empirical record and its logic were leading me. This article is clearly not a comprehensive review of the alternatives, partly because of space limitations, but also because the case for the alternatives was eloquently argued elsewhere (e.g., IPCC, 2001). It is rather a plea for some reflection in our clamour for over-simplified beliefs and solutions in the face of the climate conundrum. Due to space considerations, the article also does not explore the potential role that the lethal CRF may have played in the evolution of life, as a cause of extinctions and/or mutations. And above all, this article is not a discussion of Kyoto, a treaty with social, economic and political aims, but a scientific treatise of the past climate record. Time will rule on its validity, but in the meantime I ask that the discussion of its merits/demerits be confined to scientific ways and means. As a final point, I am indebted to several experts worldwide, covering the whole gamut of fields from astrophysics to biology and modeling, who agreed to read the manuscript in order to make sure that its statements are scientifically defensible. The journal reviewers, Brendan Murphy and Alan Hildebrand, helped to set the tone of the presentation. Beer, J., Muscheler, R., Wagner, G., Laj, C., Kissel, C., Kubik, P.W. and Synal, H.-A., 2002, Cosmogenic nuclides during isotope stages 2 and 3: Quatern. Sci. Review, v. 21, p. 1129-1139. Berner, R.A., 2003, The long-term carbon cycle, fossil fuels and atmospheric composition: Nature, v. 426, p. 323-326. 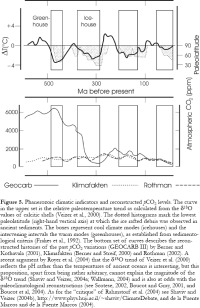 Berner, R.A. and Kothavala, Z., 2001, GEOCARB III: A revised model of atmospheric CO2 over Phanerozoic time: Am.J. Sci., v. 301, p. 182-204. Berner, U. and Streif, H., 2000, Klimafakten, Der Rückblick - Ein Schlüssel für die Zukunft: Stuttgart: E. Schweizer-bart'sche Verlagsbuchhandlung, Science Publishers. Blaauw, M., van Geel, B. and van der Plicht,J., 2004, Solar forcing of climate change during the mid-Holocene: indications from raised bogs in The Netherlands: The Holocene, v. 14, p. 35-44. Bond, G., Kromer, B., Beer, J., Muscheler, R., Evans, M.N., Showers, W., Hoffmann, S., Lotti-Bond, R., Hajdas, I. and Bonani,G., 2001, Persistent solar influence on North Atlantic climate during the Holocene: Science, v. 294, p. 2130-2136. Boucot, A.J. and Gray, J., 2001, A critique of Phanerozoic climatic modes involving changes in the CO2 content of the atmosphere: Earth Science Reviews, v. 56, p. 1-159. Boucot, A.J, Xu, C. and Scotese, C.R., 2004, Phanerozoic climate zones and paleogeography with a consideration of atmospheric CO2 levels: Paleont. J., v. 38,p. 115-122. Bowring, S.A., Williams, I.S. and Compston W., 1989, 3.96 Ga gneisses from the Slave Province, Northwest Territories, Canada: Geology, v. 17, p. 971-975. Brasier, M.D., Green, O.R., Jephcoat, A.P., Kleppe, A.K., van Kranendonk, M.J., Lindsay, J.F., Steele, A. and Grassineau, N.V., 2002, Questioning the evidence for Earth's oldest fossils: Nature, v. 416, p. 76-81. Carslaw, K.S., Harrison, R.G. and Kirkby, J., 2002, Cosmic rays, clouds and climate: Science, v. 298, p. 1732-1737. Christl, M., Strobl, C. and Mangini, A., 2003, Berylium-10 in deep-sea sediments: a tracer for Earth's magnetic field intensity during the last 200 000 years: Quatern. Sci. Rev., v. 22, p. 725-739. Clarke, T., 2003, Bubbles prompt climate-change rethink: Nature, Science Update (http://www.nature.com/nsu/nsu_pf/03 0310/030310-12.html). Crowell, J.C., 1999, Pre-Mesozoic Ice Ages: Their Bearing on Understanding the Climate system: Geol. Soc. Am. Mem.,v. 192, 106p. Dahl-Jensen, D., Mosegaard, K., Gundestrup, N., Clow, G.D., Johnsen, S.J., Hansen, A.W. and Balling, N., 1998, Past temperatures directly from the Greenland ice sheet: Science, v. 282, p. 268-271. 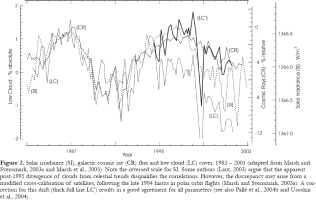 De la Fuente Marcos, R. and de la Fuente Marcos, C., 2004, On the correlation between the recent star formation rate in the Solar Neighbourhood and the glaciation period record on Earth: New Astronomy, v. 10, p. 53-66. Douglass, D.H., Pearson, B.D. and Singer, S.F., 2004, Altitude dependence of atmospheric temperature trends: climate models versus observations: Geophys. Res. Lett., v. 31, 10.1029/2004GL020103. Eichkorn, S., Wilhelm, S., Aufmhoff, H., Wohlfrom, K.H. and Arnold, F., 2002, Cosmic ray-induced aerosol formation: first observational evidence from aircraft based ion mass spectrometer measurements in the upper troposphere: Geophys. Res. Lett., v. 29,10.1029/2002GL015044. Foukal, P., 2002, A comparison of variable solar total and ultraviolet irradiance outputs in the 20th century: Geophys. Res. Letters, 29, p. 411-414, 2089,doi:102912002GL015474. Foukal, P., North, G. and Wigley, T., 2004, A stellar view on solar variations and climate: Science, v. 306, p. 68-69. Frakes, L.A., Francis, E. and Syktus, J.I., 1992, Climate modes of the Phanerozoic; The history of the Earth's climate over the past 600 million years: Cambridge University Press, Cambridge. Harrison, R.G. and Aplin, K.L., 2001, Atmospheric condensation nuclei formation and high-energy radiation: J. Atmos. Terr. Phys., v. 63, p. 1811-1819. Hayes, J.M., Kaplan, I.R. and Wedeking, K.W., 1983, Precambrian organic geochemistry: preservation, in Schopf J.W. (Ed.) Earth's Earliest Biosphere: Its Origin and Evolution. Princeton University Press, Princeton, N.J., p. 93-134. Hu, F.S., Kaufman, D., Yoneji, S., Nelson, D., Shemesh, A., Huang, Y.S., Tian, J., Bond, G., Clegg, B., and Brown, T., 2003, Cyclic variation and solar forcing of Holocene climate in the Alaskan subarctic: Science, v. 301, p. 1890-1893. Huxman, T.E., Smith, M.D., Philips, A.F., Knapp, A.K., Shaw, M.R., Loik, M.I., Smith, S.D., Tissue, D.T., Zak, J.C., Weltzin, J.F., Pockman, W.T., Sala, O.E., Haddad, B.M., Harte, J., Koch, G.W., Schwimming, S., Small, E. and Williams, D.J., 2004, Convergence across biomes to a common rain-use efficiency: Nature, v. 429, p. 651-654. Intergovernmental Panel on Climate Change (IPCC), 2001, Climate Change 2001: The Scientific Basis: Cambridge University Press. Kärner, O., 2002, On nonstationarity and antipersistency in global temperature series: J. Geophys. Res., v. 107, doi:10.1029/2001JD002024. Karoly, D.J., Braganza, K., Stoff, P.A., Arblaster, A.J., Meehl, G.A., Broccoli, A.J. and Dixon, K.W., 2003, Detection of human influence on North American climate: Science, v. 302, p. 1200-1203. Kasting, J.F., 1993, Earth's early atmosphere: Science, v. 259, p. 920-926. Kromer, B., Freidrich, M. and Spurk, M. 2001, Natürliche Klimavariationen im Spätglazial und Holozän im Spiegel von Baumringserien: Nova Acta Leopoldina,v. NF88, p. 141-159. Laj, C., Kissel, C., Mazuad, A., Channell, J.E.T. and Beer, J., 2000, North Atlantic paleointensity stack since 75ka (NAPIS-75) and the duration of the Laschamp event: Phil. Trans. R. Soc. Lond. A, v. 358, p. 1009-1025. Laut, P., 2003, Solar activity and terrestrial climate: an analysis of some purported correlations: J. Atmosph. Solar-Terrestrial Physics, v. 65, 801-812. Lee, D., and Veizer, J., 2003, Water and carbon cycles in the Mississippi river basin: potential implications for the northern hemisphere "residual terrestrial sink": Global Biogeochem. Cycles, v. 17 (no. 2),10.1029/2002GB001984. Lee, S.-H., Reeves, J.M., Wilson, J.C., Hunton, D.E., Viggiano, A.A., Miller, T.M., Ballenthin, J.O. and Lait, L.R., 2003, Particle formation by ion nucleation in the upper troposphere and lower stratosphere: Science, v. 301, p. 1886-1889. Mann, M.E., Bradley, R.S. and Hughes, M.K., 1999, Northern hemisphere temperatures during the past millennium: inferences, uncertainties and limitations: Geophys. Res. Lett., v. 26, p. 759-762. Marsh, N.D. and Svensmark, H., 2000, Low cloud properties influenced by cosmic rays: Phys. Rev. Letters, v. 85, p. 5004-5007. Marsh, N.D. and Svensmark, H., 2003a, Galactic cosmic ray and El Nino – Southern Oscillation trends in ISCCPD2 low cloud properties: J. Geophys. Res., v. 108 (D6), 4195,doi:10.1029/2001JD001264. 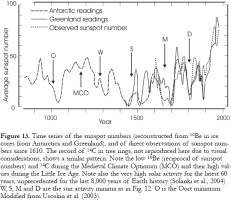 Marsh, N.D. and Svensmark, H., 2003b, Solar influence on earth's climate: Space Sci. Rev., v. 107, p. 317-325. Marsh, N.D., Svensmark, H. and Christiansen, F., 2005, Climate variability correlated with solar activity, ESA Technical Report TV-WP103(http://www.isac-esa.org/). McIntire, S. and McKitrick, R., 2003, Corrections to the Mann et al. (1998) proxy database and northern hemispheric average temperature series: Energy & Environment, v. 14, p. 751-771. Mudelsee, M., 2001, The phase relations among atmospheric CO2 content, temperature and global ice volume over the past 420 ka: Quat. Sci. Rev., v. 20, p. 583-589. Neff, U., Burns, S. J., Mangini, A., Mudelsee, M., Fleitmann, D. and Matter, A., 2001, Strong coherence between solar variability and the monsoon in Oman between 9 and 6 kyr ago: Nature, v. 411, p. 290-293. Nemani, R.R., White, M., Thornton, P., Nishida, K., Reddy, S., Jenkins, J. and Running, S., 2002, Recent trends in hydrologic balance have enhanced the terrestrial carbon sink in the United States: Geophys. Res. Lett., v. 29,10.1029/2002GL014867. Nemani, R.R., Keeling, C.D., Hashimoto, H., Jolly, W.M., Piper, S.C., Tucker, C.J., Myneni, R.B. and Running, S.W., 2003, Climate-driven increase in global terrestrial net primary production from 1982 to 1999: Science, v. 300, p. 1560-1563. Niggemann, S., Mangini, A., Mudelsee, M., Richter, D.K. and Wurth, G., 2003, Sub-Milankovitch climatic cycles in Holocene stalagmites from Sauerland, Germany: Earth Planet. Sci. Lett., v. 216, p. 539-547. Nobel, P.S., 1999, Physicochemical and Environmental Plant Physiology, second edition: Academic Press, San Diego. Ou, H.-W., 2001, Possible bounds on the Earth's surface temperature: From the perspective of conceptual global mean model: J. Climate, v. 14, p. 2976-2988. Pallé, E., Goode, P.R., Montañés-Rodriguez, P. and Koonin, S.E., 2004a, Changes in Earth's reflectance over the past two decades: Science, v. 304, p. 1299-1301. Pallé, E., Butler, C.J. and O'Brien, K., 2004b, The possible connection between ionization in the atmosphere by cosmic rays and low level clouds. J. Atmosph. Solar-Terr. Physics, v. 66, p. 1779-1790. Petit, J.R., Jouzel, J., Raynaud, D., Barkov, N.I., Barnola, J.-M., Basile, I., Benders, M., Chappellaz, J., Davis, M., Delayque, G., Delmotte, M., Kotlyakov, V.M., Legrand, M., Lipenkov, V.Y., Lorius, C., Pépin, L., Ritz, C., Saltzman, E. and Stievenard, M., 1999, Climate and atmospheric history of the past 420,000 years from the Vostok ice core, Antarctica: Nature, v. 399, p. 429-436. Prentice, I.C., Farquhar, G.D., Fasham,M.J.R., Goulden, M.L., Heimann, M., Jaramillo, V.J., Kheshgi, H.S., LeQuéré,C., Scholes, R.J. and Wallace, D.W.R., 2001, The carbon cycle and atmospheric carbon dioxide, in J.T. Houghton, V. Ding, D.J. Griggs, M. Noguer, P.J. van der Linden, X. Dai, K. Maskell and C.A. Johnson (Eds. ), Climate Change 2001: The Scientific Basis, p. 183-237, Cambridge University Press, Cambridge. Rahmstorf, S.D., Archer, D., Ebel, S., Eugster, O., Jouzel, J., Maraun, D., Neu,U., Schmidt, G.A., Severinghaus, J.P., Weaver, A.J. and Zachos, J., 2004, Cosmic rays, carbon dioxide and climate: EOS, v. 85, p. 38-41. Ramaswamy, V., Boucher, O., Haigh, J.,Hauglustaine, D., Haywood, J., Myhre,G., Nakajima, T., Shi, G.Y. and Solomon,S., 2001, Radiative forcing of climate change, in J.T. Houghton, V. Ding, D.J. Griggs, M. Noguer, P.J. van der Linden,X. Dai, K. Maskell and C.A. Johnson (Eds.) Climate Change 2001: The Scientific Basis, p. 340-416, Cambridge University Press, Cambridge. Rind, D., 2002, The sun's role in climate variations: Science, v. 296, p. 673-677. Rossow, W.B., Henderson-Sellers, A. and Weinreich, S.K., 1982, Cloud feed-back: A stabilizing effect for the early earth? : Science, v. 217, p. 1245-1247. Rothman, D.H., 2002, Atmospheric carbon dioxide levels for the last 500 million years: Proc. Natl. Ac. Sc., v. 99, p. 4167-4171. Royer, D.L., Berner, R.A., Montañez, I.P.,Tabor, N.J. and Beerling, D.J., 2004, CO2 as a primary driver of Phanerozoic climate: GSA Today, v. 14, p. 4-10. Sagan, C. and Mullen, G., 1972, Earth and Mars: Evolution of atmospheres and surface temperatures: Science, v. 177, p. 52-56. Schidlowski, M., Eichmann, R. and Junge,C.E., 1975, Precambrian sedimentary carbonates: carbon and oxygen geochemistry and implications for the terrestrial oxygen budget: Precambrian Res., v. 2, p. 1-69. Schopf, J.W., 1983, Earth's Earliest Biosphere: Its Origin and Evolution: Princeton University Press, Princeton,N.J., 543 pp. Schwartz, S.E., 2004, Uncertainty requirements in radiative forcing of climate change: J. Air Waste Management Assoc.,v. 54, p. 1351-1359. Scotese, C.R., 2002, Paleomap Project, Climate History: (www.scotese.com/climate.htm). 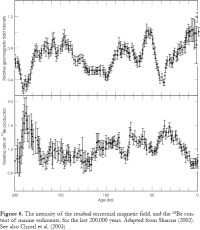 Sharma, M., 2002, Variations in a solar magnetic activity during the last 200 000 years: is there a sun-climate connection? : Earth Planet. Sci. Lett., v. 199, p. 459-472. Shaviv, N.J., 2002a, Cosmic ray diffusion from the galactic spiral arms, iron meteorites, and a possible climatic connection? : Phys. Rev. Lett., v. 89, 051102. Shaviv, N.J., 2002b, The spiral structure of the Milky Way, cosmic rays, and ice age epochs on Earth: New Astron., v. 8, p. 39-77. Shaviv, N.J., 2003, Towards a solution to the early faint sun paradox: a lower cosmic ray flux from a stronger solar wind: J. Geophys. Res., v. 108(A12), 1437,doi:10.1029/2003JA009997. Shaviv, N.J. and Veizer, J., 2003, Celestial driver of Phanerozoic climate? : GSA Today, v. 13/7, p. 4-10. Shaviv, N.J. and Veizer, J., 2004a, Comment on "CO2 as a primary driver of Phanerozoic climate" by Royer et al. : GSA Today, v. 14/7, p. 18. Shaviv, N.J. and Veizer, J., 2004b, Comment, EOS, v. 85, p. 510. Shields, G. and Veizer, J., 2002, Precambrian marine carbonate isotope database: Version 1.1: Geochemistry, Geophysics, Geosystems, 3(6), June 6 2002, 12 p. (http://g-cubed.org/gc2002/2001GC000266). Solanki, S.K., 2002, Solar variability and climate change: is there a link? : Astron. Geophys., v. 43, p. 5.9-5.13. Solanki, S.K., Usoskin, I.G., Kromer, B., Schussler, M. and Beer, J., 2004, Unusual activity of the sun during recent decades compared to the previous 11,000 years: Nature, v. 431, p. 1084-1087. Soon, W. and Baliunas, S., 2003, Proxy climatic and environmental changes of the past 1000 years: Climate Res., v. 23, p. 89-110. St-Onge, G., Stoner, J.S. and Hillaire-Marcel, C., 2003, Holocene paleomagnetic records from the St. Lawrence estuary, eastern Canada: centennial- to millennial-scale geomagnetic modulation of cosmogenic isotopes: Earth Planet. Sci. Lett., v. 209, p. 113-130. 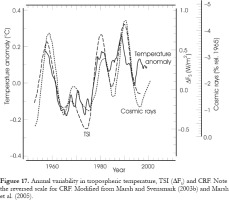 Svensmark, H., 1998, Influence of cosmic rays on earth's climate: Phys. Rev. Letters,v. 81, p. 5027-5030. Svensmark, H. and Friis-Christensen, E.,1997, Variation in the cosmic ray flux and global cloud coverage – A missing link in solar-climate relationships: J. Atm. Solar-Terrestrial Phys., v. 59, p. 1225-1232. Taiz, L. and Zeiger, E., 1991, Plant Physiology: The Benjamin/Cummings Publishing Company, Inc., Redwood City, CA. Telmer, K.H and Veizer, J., 2000, Isotopic constraints on the transpiration, evaporation, energy and GPP budgets of a large boreal watershed: Ottawa River basin, Canada: Global Biogeochemical Cycles,v. 14, p. 149-166. Tinsley, B. A. and Deen, G.W., 1991, Apparent tropospheric response to MeVGeV particle flux variations: A connection via electrofreezing of supercooled water in high-level clouds? : J. Geophys. Res. (Atmospherics), v. 96, Number D12,p. 22,283-22,296. Usoskin, I.G., Solanki, S.K., Schüssler, M., Mursula, K. and Alanko, K., 2003, A millenium scale sunspot number reconstruction: evidence for an unusually active sun since the 1940's: Phys. Rev. Lett., v. 91, p. 211101-1 - 211101-4. Usoskin, I.G., Marsh, N., Kovaltsov, G.A., Mursula, K. and Gladysheva, O.G., 2004, Latitudinal dependence of low cloud amount on cosmic ray induced ionization: Geophys. Res. Lett, v. 31, L16109, doi: 10.1029/2004GL019507. 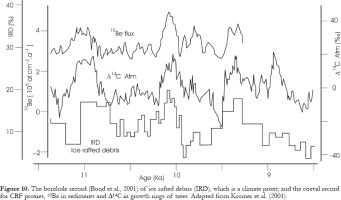 Vakulenko, N.V., Kotlyakov, V.M., Monin, A.S. and Sonechkin, D.M., 2004, Evidence for the leading role of temperature variations in the Vostok ice core record: Dokl. Russian Acad. Sci., Earth Sciences, v. 397, p. 663-667. Veizer, J., Ala, D., Azmy, K. , Bruckschen, P., Buhl, D., Bruhn, F., Carden, G.A.F., Diener, A., Ebneth, S., Goddéris, Y., Jasper, T., Korte, C., Pawellek, F., Podlaha, O.G. and Strauss, H., 1999, 87Sr/86Sr, δ13C and δ18O evolution of Phanerozoic seawater: Chem. Geol., v. 161, p. 59-88. 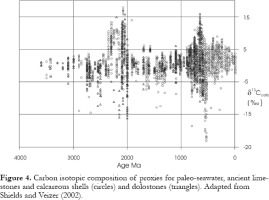 Veizer, J., Godderis, Y. and François, L.M., 2000, Evidence for decoupling of atmospheric CO2 and global climate during the Phanerozoic eon: Nature, v. 408, p. 698-701. 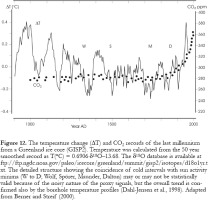 Wallmann, K., 2004, Impact of atmospheric CO2 and galactic cosmic radiation on Phanerozoic climate change and the marine δ18O record. Geochemistry, Geophysics, Geosystems, v. 5, Q06004, doi:10.1029/2003G000683. Zheng, D.L., Prince, S.D. and Wright, R., 2003, Terrestrial net primary production estimates for 0.5º grid cells from field observations - a contribution to global biogeochemical modeling: Global Change Biology, v. 9, p. 46-64.